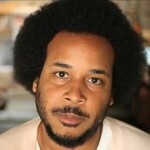 Tahir Hemphill is an award-winning advertising creative and multimedia artist. His creative practice is interdisciplinary, covering digital humanities, art, communications design, data visualization and computational linguistics. Hemphill holds a B.A. in Spanish Language from Morehouse College, and a M.S. in Communications Design from Pratt Institute. He has conceived and implemented design-based solutions for brands including Mercedes Benz, L’Oreal, Verizon, and Microsoft. His work has been featured at MoMA, Siggraph, Queens Museum of Art, and the Schomburg Center for Research in Black Culture. His current project, The Hip Hop Word Count, is a searchable rap almanac. Hemphill also operates the creative enterprise Staple Crops, and manages the media arts education program for Red Clay Arts, a nonprofit incubator for contemporary artists that he co-founded in 2000.